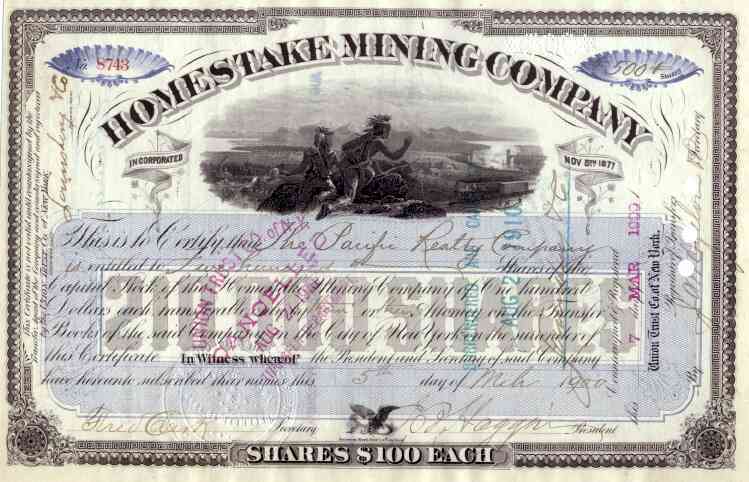 1900 Homestake Mining Stock Certificate signed J. B. Haggin. Classic scripophily document with vignette of Native Americans overlooking valley with train, river and homesteads. George Hearst, J.B Haggin and Lloyd Tevis bought a group of mines in the Black Hills of the Dakota Territory in 1877, establishing the Homestake Mining Co. Before it closed in 2002, it was the oldest and one of the most prolific gold producers in the U.S. James Ben Haggin was one of the most successful mining entrepreneurs of the 19th century. In addition to ownership in the Homestake, he also was an owner in the Anaconda copper mine in Montana and numerous silver mines in Arizona and California. VF+ condition.